Street food has revolutionised the London food scene recently, particularly the burgeoning street vendors setting up shop in London’s food markets. Competition is getting fierce in street food hot spots like Borough Markets, KERB, Street Feast, and most recently, Hawker House. For consumers this is good news as the food standard continues to get higher and higher. International options like Kimchi Kult, Mama’s Jerk Kitchen and Yum Bun continue to hit London at an explosive pace. I was recently invited to the launch of the new street food menu at Chor Bizarre in Mayfair as part of the ‘Old Bombay Street Food Festival’. 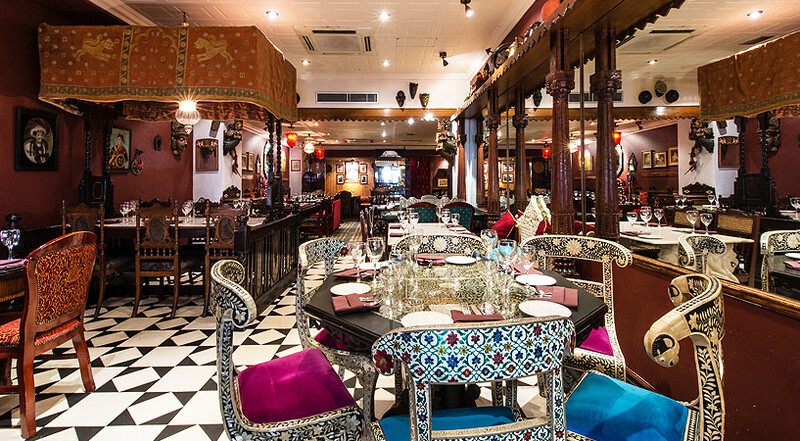 Chor Bizarre was originally London’s first Indian tea bar and is also, strangely, the only restaurant in London serving a menu of traditional Kashmiri cuisine. 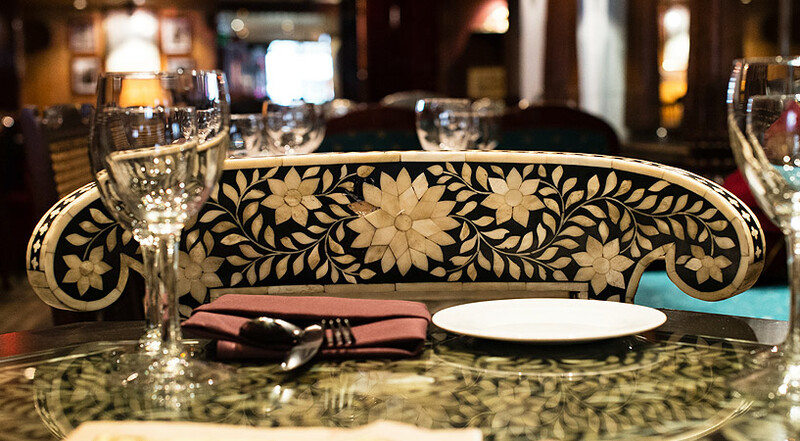 The menu is largely inspired by the food markets of old Mumbai with dishes being carefully selected to showcase the variety Mumbai’s thieves’ market has to offer. Despite being a huge fan of Indian food I have been a somewhat stranger to street food in this region. 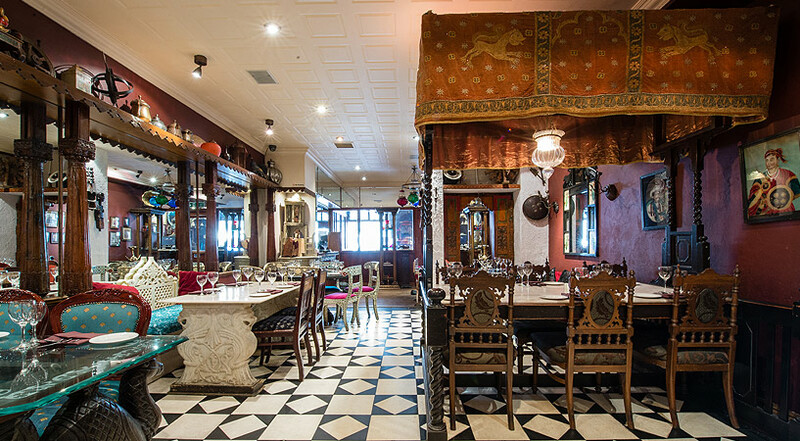 Chor Bizarre reminds me of an Aladdin’s cave, full of antiques, bric-a-brac and other eccentric furnishings. True to its name, it captures the spirits of the ‘thieves market’ perfectly with its mind-boggling kaleidoscope of colours and decor. As part of the feast, we were offered a whopping 10 course selection of the street food on the menu. The Bombay Bhel, was full of moreish rice puffs delicately seasoned with red onions and strips of raw mango and a bit of chutney for added sweetness. The Sev Batata Puri were golden morsels of wheat crisps topped with potato, yoghurt and chutney and a sprinkling of crunchy sev. 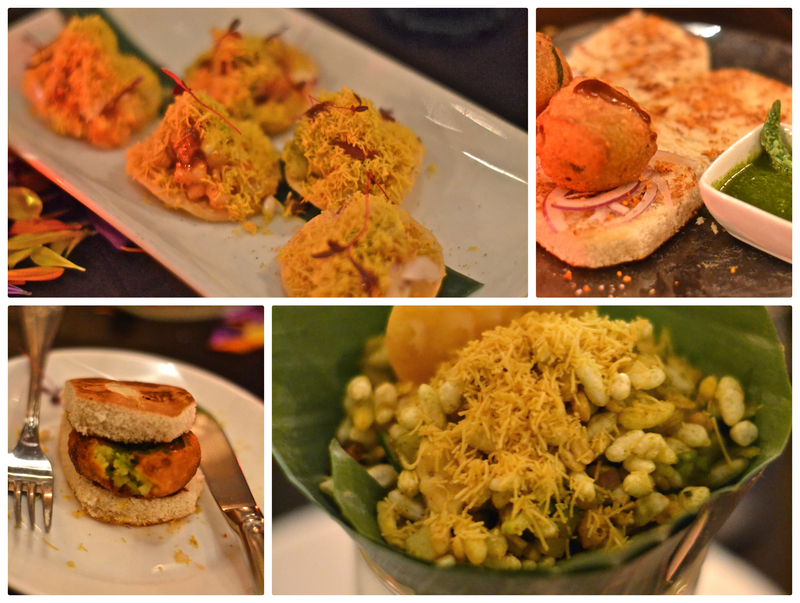 One of my favourites for the evening was the Batata Wada Pao which reminded me of a deconstructed burger. The buttery potato dumpling, spiced delicately with turmeric was unashamedly smashed into the bun until it oozed out the sides. The special sauce was the perfect accompaniment with hints of chilli, garlic and peanut coming through it. There was nothing glamorous about the Paneer Bread Pakora, which was essentially a deep fried sandwich filled with Indian cottage cheese and coriander offset gorgeously by a taste bud cooling mint chutney. Generously stuffed with egg and chicken and wrapped with brown paper, the Andy Paratha Roll was deliciously moreish and really felt like something I would eat on the streets of Mumbai. The Keema Ghotala was a beautifully fragrant dish, executed brilliantly with its spicy flavours infusing through the finely chopped mince. After seven gut wrenching dishes, I struggled to get through the Tawa Bater Tak-a-tak – a quail breast cooked in a masala curry. The addition of fresh coriander made the dish beautifully fragrant. The quail itself was succulent and tender – my only regret was not having more room. This was easily the winning dish of the evening. I’m not a huge fan of Indian desserts but I just managed to squeeze in a small portion of the Royal Falooda and Phirni. 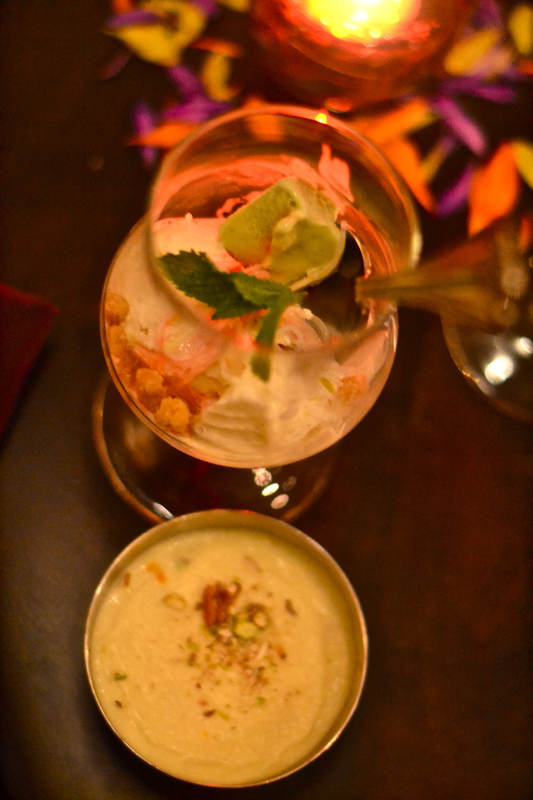 The Falooda was by far my favourite, an elegant mess of kulfi, rose syrup, nuts, vermicelli and basil seeds. I would much prefer this type of food eaten off a paper plate on the streets of Mumbai rather than a fine dining restaurant but, as far as quality goes, I was very impressed. I hope to see more Indian street food like this on the London food scene in the future – you would definitely see me lining up for more. 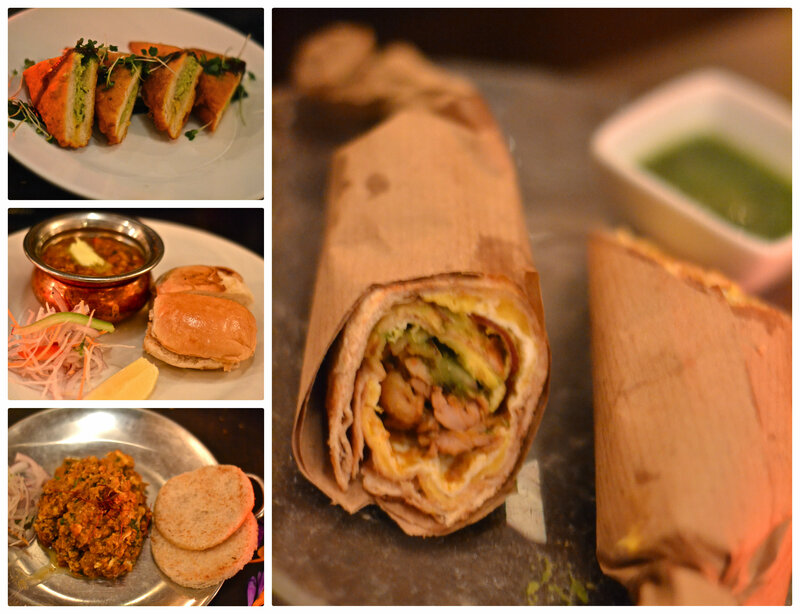 The Old Bombay Street Food menu runs until the 10th of December. I was a guest of Chor Bizarre.